Adult versions of the Jr. Cellions. They are generally more powerful, but with the same elemental strengths and weaknesses. Now, though, they have a fire-based magic attack that they can use when provoked. Found in Orbis: Garden of Red II and Stairway to the Sky I, where it spawns with Lioner and Grupin. Adult versions of the Jr. Lioners. They are generally more powerful, but with the same elemental strengths and weaknesses. Now, though, they have a lightning-based magic attack that they can use when provoked. Found in Orbis: Garden of Yellow II and Stairway to the Sky I, where it spawns with Cellion and Grupin. Adult versions of the Jr. Grupins. They are generally more powerful, but with the same elemental strengths and weaknesses. Now, though, they have an ice-based magic attack that they can use when provoked. Found in Orbis: Garden of Green II and Stairway to the Sky I, where it spawns with Lioner and Cellion. A small dark cat found at Garden of Darkness I in Orbis, and summoned by Eliza. Adult versions of the Jr. Lucidas. They are generally more powerful, but with the same elemental strengths and weaknesses. Now, though, they have a new magic attack that they can use when provoked. This monster is found in the deepest part of Orbis' Color Gardens, Stairway to the Sky II. They also appear in large numbers at Zipangu's Hall of Mushroom, spawning alongside the Blue Mushdad. A pixie found in Orbis's Cloud Parks I and II. It possesses a magic attack that it will often use in self-defense. Their magic is fairly easy to dodge at a distance, as it is a projectile. An upgraded form of Star Pixie. It still uses a fairly easy to avoid magic attack but attacks with its body also. Instead of shooting stars, it shoots blue moons at anyone who attacks it. Found in Orbis: Cloud Park III and IV. An upgraded form of Lunar Pixie. It still uses a fairly easy to avoid magic attack but attacks with its body also. Instead of shooting moons, it shoots suns at anyone who attacks it. Found in Orbis: Cloud Park V and VI. A security robot found at the Forgotten Laboratory, where Xenon was turned into a Xeneroid. Xenon must return here and defeat these for a quest. A pink flower found in Orbis. Since it's a plant, it's immobile. There are two breeds of them: one breed does not attack you unless you attack it first, found at "Strolling Path I", and another breed which attacks you whenever you get close, found at "Disposed Flower Garden". A dark version of the Nependeath. Weak to holy attacks and immobile. The auto aggressive version is only found in Orbis: Disposed Flower Garden, and the version that isn't is found in Orbis: Strolling Path II. A small sea-urchin like monster found in east Aqua Road. To reach this monster easily, use the dolphin taxi. This monster can send out a burst of spikes to attack whenever you go close to it, but it is immobile. It proves to be relatively harmless to long-ranged characters such as Hermits, Archers, and Magicians, unless they spawn in a swarm around the player. Has the same functions as Papulatus' Darkstars, except summoned by Pianus. This is the clone of Eliza, the queen of all Lucidas and the Goddess's Pet. This clone resulted from Eliza's anger due to the whole conflict with Papa Pixie. She summon Jr. Lucidas to protect her. Found in Orbis: Garden of Darkness II because the actual Eliza confined her there. The actual Eliza is an NPC for a quest where you have to use a huge Lyre to produce the song "Twinkle Twinkle Little Star". A living piece of rock. Found in Orbis Tower's upper levels. A living piece of rock. Slower than the Jr. Sentinel, but bigger and possesses a magic attack that is impossible to avoid. Found in Orbis Tower's upper levels. The fiery version on the Sentinel. Easily slain by Ice attacks. Uses a magic attack that is impossible to avoid. Found in Orbis Tower's upper-middle levels. The icy version of the Sentinel. Easily slain by fire attacks. Uses a magic attack that is impossible to avoid. Found in Orbis Tower's middle-lower levels. A green seahorse found in east Aqua Road. A yellow seahorse found in east Aqua Road. A clownfish found in east Aqua Road. Another floating monster from Orbis Tower, covered in fur. Found in the lower, icy levels of the tower. It is also seen between Orbis Tower and El Nath. It is resistant to ice and weak to fire. A dark version of the Leatty. As a result, it is weak against holy and resistant to darkness, but loses its weakness to fire and strength against ice. Found in the lower floors of Orbis Tower. A small penguin that slides around in the lower levels of Orbis Tower, and just between the Orbis Tower and El Nath. A transparent fish. Gives off a squealing sound when hit. Found east of Aqua Road. A fish with a flower on its head. Gives off a cow-like sound when hit. Found east of Aqua Road. A shrimp monster that is found in east Aqua Road. They can only do small jumps and don't move particularly fast or slow. The small jumps sometimes causes melee characters to completely miss it, meaning it didn't even say the word "miss". A small Yeti found close to El Nath. A Jr. Yeti that has absorbed the power of darkness. No longer weak to fire or resistant to ice, this Dark Jr. Yeti is instead weak to holy attacks and resistant to darkness. Found close to El Nath. A masked fish that lives in east Aqua Road, close to Aquarium. A Pepe that somehow got a snorkel and swims. Plenty of them reside in Orbis Tower <B2> and in west Aqua Road. A small seal that resides in west Aqua Road, directly outside the tower. Moves along the ocean floor. A blue penguin. While it doesn't deal a lot of damage, it is extremely fast and generally very annoying. Found at "El Nath: Cold Field I", and in a Hidden Street called the Crown Flier. A Pepe that has absorbed the power of darkness. Like other "dark" El Nath monsters, it loses its previous element and becomes weak to holy. Luckily, that means those with a freezing move can now use it for good effect. Found at "El Nath: Cold Field II", and in a Hidden Street called the Crown Flier. A blue puffer fish found in west Aqua Road. It has an attack where it launches its spikes at you, but it has short range. A purple puffer fish found in west Aqua Road. It has an attack where it launches its spikes at you, but it has short range. A brown wolf found near El Nath. It possesses a magic attack which can be quite annoying. You can jump when it attacks to avoid the spell. An large seal with a ranged attack of lightning-based magic. Located directly to the west of Aquarium. A large seal with a ranged attack of ice-based magic. Located directly to the west of Aquarium. The first form of the Geist Balrog. 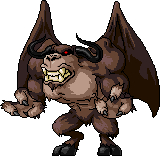 Basically the same as a Jr. Balrog, but with higher HP. This monster is part of the Le Tierre quest line in Edelstein's Verne Mine. It must be captured with a Metal Cage after being damaged. This page was last edited on 3 March 2018, at 20:10. This page has been accessed 369,548 times.